The Pioneer DJM-250MK2 is the gateway to the DJM range of mixers. The Pioneer DJM-250MK2 DJ Mixer offers a gateway to the DJM mixer range, delivering staggering value with pro-grade features including Sound Colour fx and a built in audio interface which also offers Rekordbox DVS compatibility (software included). Pioneer’s DJM250MK2 inherits its Sound Colour FX filter and Magvel Crossfader from the industry standard DJM-900NXS2. The Magvel fader is accurate and highly durable (tested to be capable of approximately 10 million movements) and the uncluttered lower section of the mixer top plate provides the freedom for you to perform complicated scratch patterns and techniques. If long blends are more your style then you can adjust the curve on the cross fader or use the channel faders and combine these with the filters to give you transition options. As you’d expect, the upper half of the DJM250MK2 is just as capable as the fader section with each channel featuring a 3-band isolator allowing you to completely eliminate your chosen frequency range. When it comes to sound the DJM-250MK2 delivers warm, high quality audio from both analogue and digital sound sources using dithering technology. The built-in audio interface allows you to connect the mixer to your MAC or PC using the included USB cable and you can choose to take control with Rekordbox DVS and turntables. 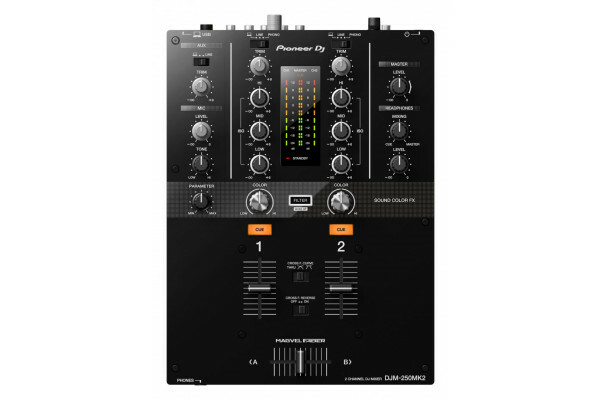 Seen the Pioneer DJM-250MK2 DJ mixer from another UK Dealer Cheaper?